Armagh the smallest county in Northern Ireland, has a rich, colourful and even tempestuous history. War, famine and emigration over the last four centuries have all contributed to forming the distinctive character of its people. The constant struggle between Planter and Gael that has characterised the county since the Plantation in the early 17th century may be seen in, for example, the almost equal division of the most popular surnames. The county town, the city of Armagh, is the ecclesiastical capital of both the Catholic and Protestant religions on the island. By the end of the 18th century the county became one of the most prosperous and the most densely populated in Ireland. Its turbulent history has taken its toll on the evidence that remains. Many records were lost, including those in the destruction of the Public Record Office in Dublin in 1922; much has, however, survived to aid the dedicated family or local historian and is accessible in the detailed catalogues and user-friendly searching aids in the Public Record Office of Northern Ireland. Ian Maxwell writes both as an historian and an archivist eager to encourage researchers to use the fullest range of sources available. 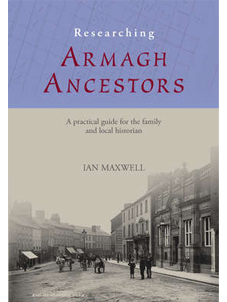 An exceptional feature of Researching Armagh Ancestors: A Practical Guide for the Family and Local Historian are the reference appendices. These include a breakdown of administrative divisions, listing some 1400 townlands and also unofficial placenames that disappeared from official use after the standardisation of placenames in the 1830s. Also provided for each townland are the civil parish, barony and poor law union, plus the vital district electoral division details that greatly facilitates the researcher using sources such as census returns and property valuation records. Other appendices provide crucial archival references to tithe and valuation records and civil and Catholic parish maps are included. Such reference appendices will be a feature of further books in this series of county guides for the family and local historian.